Looking to install a TV wall mount? 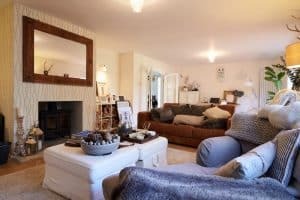 Thinking about doing a little restyling of your TV room at the same time? Finding an interior design style that works for your home is a great way to express yourself and ensure you get the most of your space. And if you’re about to install a TV, it’s the perfect time to think about how you can upgrade and style the rest of your room, as well. 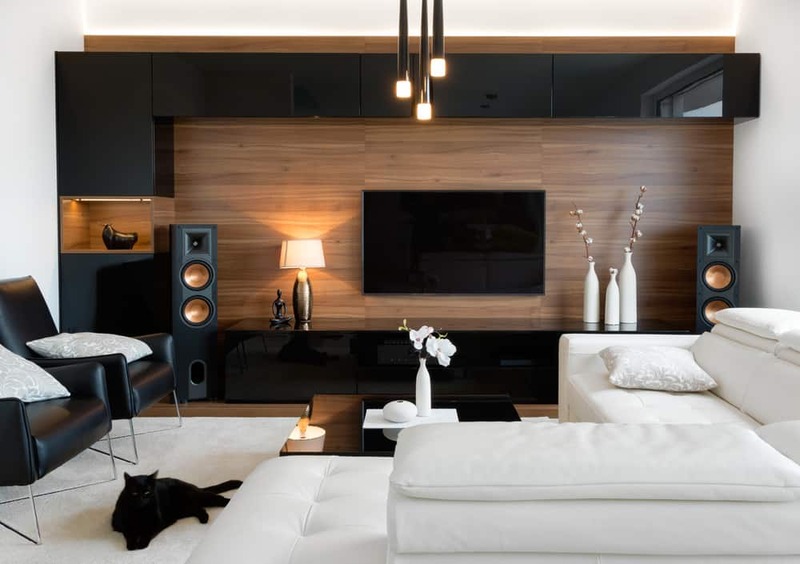 We’ve put together 9 creative TV wall mount installations to help inspire you to integrate your entertainment and tech with the aesthetic of your architecture and interior design style. 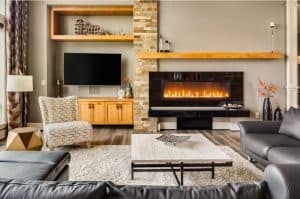 But first, before we get into aesthetics and style, let’s talk about 5 important (and practical) factors that might affect how you do your TV wall mount installation. Your space and the degree of flexibility in positioning you want will determine which type of wall mount is best for your TV. Read more in our article, How to Figure out What Kind of TV Wall Mount You Need. 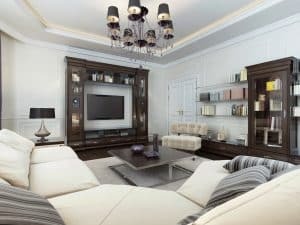 If you’re looking to re-style your TV room, you’ll be happy to know that you can do a TV wall mount installation on nearly any kind of surface – you just need the right techniques. Read more about this in our article, Guide to Mounting a Television: Wood studs, Metal Studs, or No Studs. Before you go ahead and give your TV a semi-permanent place on the wall, you want to make sure you’ve picked the best possible location. 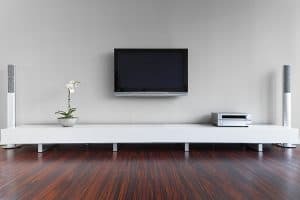 Think about things like sun glare, and the best positioning for your couches to make sure you get your TV wall mount installation in the right spot the first time. Finally, it’s important to think about what you’ll do with the wires and cords (like your TV antenna cord, connections to consoles, and so on). 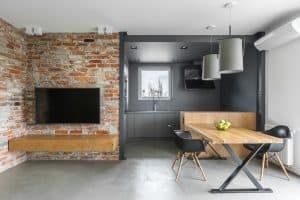 Depending on your wall type, you should be able to conceal all your wires behind your TV wall mount or inside your wall cavity for a minimal, clean finish. Or if your wall is solid brick or concrete, use a cord concealer to help keep your cords neat. Now that we’ve covered the practical stuff, let’s talk visuals. When you’re doing a TV wall mount installation, it’s the perfect time to think about what you want your space to look like, and maybe even do a mini–renovation. So, check out these 9 creative TV room styling ideas for inspiration! Less is more. If you want a minimalist aesthetic in your home, a TV wall mount installation is non-negotiable. Not only do you get clean lines and minimised cords, but you can do away with your entire TV cabinet if you want to. Maintain a minimalist look by keeping your decorations simple and down to the basics. 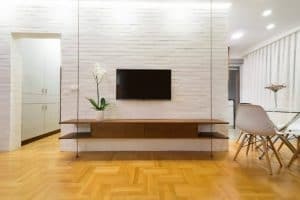 You might not be able to get your magical hidden passageway, but you can have your very own hidden TV thanks to a clever TV wall mount installation trick. Simply put a mirror or framed artwork on the front, and a TV on the back, with a TV wall mount that flips out to reveal the entertainment options underneath. Perfect for rooms that do double-duty as family rooms, TV rooms, dining, bedrooms, and more. Turn a man cave into a stylish theatre with a TV wall mount installation that showcases your huge TV at its best. Add in surround sound speakers and gaming consoles, and you’ve got a room any gamer or entertainment lover would be happy to be holed up in for hours. Scandinavian or Nordic interiors are very much on trend right now, and they’re a great look for TV room areas. To get the look, choose bright and neutral colours, plenty of lighting, minimal clutter, and fresh flowers or indoor plants. Create a feature wall to house your TV with bright textures like painted brick, wood panelling, or wallpaper. Then after your TV wall mount installation is complete, you can choose a cabinet with clean lines to sit under your TV and display your favourite pot plant or treasures. 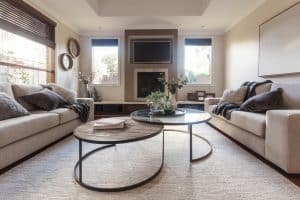 Contemporary modern is all about balance – a mixture of textures, warm neutrals, and shapes – to create a TV room anyone can relax and get comfortable in. Create a cohesive look with similar shapes and colours, like black furniture legs or fireplace to tie in with your wall mounted TV. The industrial look is perfect for inner-city apartments, taking its inspiration from converted old factories and industrial spaces. Think exposed brick, polished concrete, and gunmetal grey. Brighten your space with large-scale featured lighting and warm wooden furniture. And get your TV wall mount installation sorted to maximise the feeling of spaciousness – and yes, you can wall mount on a brick wall and concrete! Exposed wires are acceptable for the industrial aesthetic, but if you prefer to conceal them, you can use a discrete cord cover. Get those beachy vibes into your home and you’ll feel like you’re always on holidays. (Or style your Airbnb for extra high-end holiday appeal!) Go with plenty of brights and neutrals so you can maximise the natural light coming in your windows. Then tie in your TV wall mount installation with a few darker accessories, like dark grey cushions and black-framed pictures on the wall. If you’re a little bit vintage, you can bring that classic look into your TV room. Frame your TV wall mount installation with dark timber shelving to display your favourite books, old records, and your parents’ vintage radio. Balance out the dark colours with a cream coloured lounge and fresh white or dove grey wall colours. Add a feature chandelier and polished chrome touch lamp to finish off your retro glam space. Still not sure? Check out our 15 Point Checklist for Choosing a TV Wall Mount Installation Service and 11 Reasons To Leave Your TV Wall Mount Installation Up To the Pros. Ready to Book Your TV Wall Mount Installation? Install My Antenna can help with any and all your TV wall mount needs. We know that your home and entertainment setup is unique to you and your family, and we’re happy to put together a custom TV wall mount installation package that’s just right for you and your home. You can call us on 1300 800 123 for a free quote or book in your TV wall mount installation today!